High Anxiety by Charlotte Hughes, a Mysterious Review. 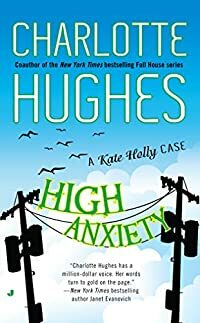 Review: Psychologist Kate Holly continues to juggle a career, her family and friends all the while dealing with a temporary receptionist who seems to have issues of her own to deal with in High Anxiety, the third mystery in this series by Charlotte Hughes. After Kate's best friend and regular receptionist, Mona, takes a leave of absence to recover from a sudden outbreak of hives, her mother steps in to fill the void. But it soon becomes clear that families that stay together don't work together, so Kate contacts a temp agency for a replacement. Abigail Davis is about the same age as Kate, is personable, and most importantly, agrees not to offer advice to Kate's patients behind her back, something Kate's mother was keen on doing. still, there's something a bit peculiar about Abigail, which becomes more apparent as she takes on a new appearance and becomes more involved in Kate's personal life. High Anxiety is a pleasant mystery, with a minimum of violence that will appeal to readers who prefer their cozies more gentle than harsh. But it lacks the light, humorous touch that the premise seems to imply. The book opens with, "My name is Kate Holly. I'm a clinical psychologist. My patients think I'm normal. If I've told them once, I've told them a thousand times: There is no such thing as normal." The author surrounds Kate with an eclectic cast of characters, certainly not an average bunch but not so quirky to be outlandish either. Most are rather compelling, and in some ways more interesting (in a clinical psychological way) than Kate herself. Still, little humor is extracted from them or the situations in which they find themselves … and a little humor would have gone a long way towards making the predictably plotted story a lot more enjoyable. Acknowledgment: Penguin Group provided an ARC of High Anxiety for this review.